If you don’t plan around the trees in your yard with your home improvement project, your trees could suffer from many ill effects! Fall is the best time of year for home improvement projects. The weather is nicer, the days are still long enough you can accomplish a great deal on the weekend, and the summer afternoon rains are a thing of the past. If you are trying to design a home improvement project around trees in your yard, here are some of the considerations you need to make to ensure a successful result. Many tree problems related to home improvement projects occur outside of what many homeowners think of as the construction site. If you are doing a major remodeling project or backyard construction, the site can encompass your entire front and back yards. Excavation takes a toll on the entire ecosystem, not just the direct area where you dug up. Things will be moving in and out of your yard during a home improvement project, so the soil in your front yard might be severely compacted when you are doing work in your backyard. Most home improvement projects take place above ground, but the effects on trees are often out of sight underneath the soil. If roots don’t have access to enough nutrients, water, and oxygen they will start to die. Trees with shallow roots might die from the stress of the home improvement project. Also, keep in mind that the roots of your trees might spread much longer and broader than you think. Make every effort to protect the roots of your trees, as the damage from a home improvement project could undo hundreds of years of growth. 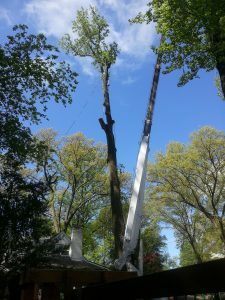 If you aren’t sure whether or not your tree will be negatively impacted by your home improvement project, work with Nelson Tree Specialist to develop a plan for protecting your trees and ensuring their prolonged health! This entry was posted on Friday, September 8th, 2017 at 11:24 am. Both comments and pings are currently closed.